Nestled at almost 5,000’ elevation, Thunderstruck Ridge Cabin is unrivaled for its 180° phenomenal views of the Smoky Mountains with easy access from the main road! This is a perfect Maggie Valley vacation spot for a couple or small family and is a 2 bedroom, 3 bath authentic log cabin featuring a full wrap-around porch, spacious vaulted ceilings, hickory hardwood floors throughout with Berber carpet downstairs, and can comfortably sleep a family of five. The main level contains a master bedroom with a luxurious king pillow top bed, 42” flat screen LCD TV, spacious walk-in closet and master bath with double vanities and relaxing Jacuzzi tub. The second bedroom has a roomy queen pillow top bed and private access to the common bathroom. The living room has a gas fireplace, comfortable reclining leather furniture and a flat screen 42” LCD television with Direct Satellite TV and DVD player to make you feel right at home. The kitchen is fully stocked and offers everything you need. Downstairs features an authentic wood burning stove, full bath, and a sectional sofa that folds out into a comfortable bed. The partial kitchen is complete with built-in microwave and wet bar. A large TV with surround sound, DVD player, board games and comfortable leather furniture. This is the perfect setup for kids or privacy for guests. Visit www.thunderstruckridge.com for more photographs! Scott and I having been searching for years for the perfect log cabin in the mountains and we finally found the ideal location that contains everything we could ever ask for. We named the cabin Thunderstruck Ridge after this vantage point on the Blue Ridge Parkway. 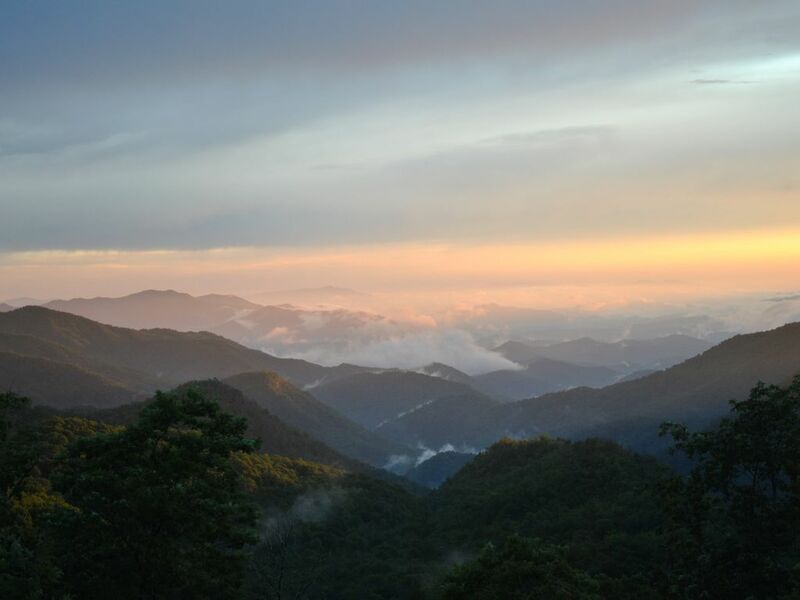 The view from Thunderstruck Ridge Cabin is one of the best you will find in Western North Carolina- read our guest comments to see! This place has everything nearby- Cataloochee ski area, Great Smoky Mountain Railroad, beautiful hiking trails, trout fishing, gorgeous waterfalls, fabulous restaurants, quaint shops, Cherokee casinos, horseback-riding, the Blue Ridge Parkway, white water rafting, zip-lining and gem mining. The views from the cabin are simply spectacular and everyone is so friendly! Thunderstruck Ridge Cabin offers something for everyone. Maggie Valley is known for its unrivaled location and friendly, small town character that instantly makes you feel right at home. This ideal vacation rental cabin offers something for everyone… whether you delight in the challenge of a strenuous hike to the crest of a mountain, embrace the thrilling action of the ski slopes, or the quiet enjoyment of fishing or horseback riding… you have come to the right place to enjoy your vacation. This log cabin was built with a loving attention to detail and offers all the comforts and convenience of home. The kitchen includes everything for you- all you need to bring is groceries and an appetite! Easy access via a gravel road and cabin is located only 9/10 of a mile from the main road. Less than 10 minutes to downtown Maggie Valley, Cataloochie Ski Resort and Blue Ridge Parkway. May need 4-wheel drive in winter season. Wow! That's all our family could say for the first few moments we walked into Mr. & Mrs. Moore's cabin. The views are breathtaking and the cabin is so lovely! Our family's Thanksgiving vacation was fantastic and, I believe, a large contributing part came from our stay at TSR! The cabin is wonderfully decorated, super clean, has a picnic table that our family loved to eat at, all while looking at the exceptional views. In fact, the Blue Ridge Parkway was closed during our entire vacation however, we felt that the views at TSR were better than some you find on the Blue Ridge! The drive up to the cabin was smooth and we were very pleased to have our own area to take the trash to. Many cabins we have stayed at in Maggie do not and you find yourself traveling with trash… not a delight. =) There are so many more wonderful things I could mention about TSR but in the end, we highly recommend TSR and would love to come for another stay very soon! Thank you again for opening your cabin to our family!! Scott and Lissa have a beautiful cabin with an extraordinary view! This is the third time we have stayed in this cabin and I wished we could have stayed longer. It is perfect for one or two couples and possibly more if you use the downstairs. Everything you need is there waiting for you! The one tiny drawback is no wireless internet. It was a bit frustrating for me, but if you can live without internet, then this is the cabin for you. Reserve it immediately!! Good news, Cindy! We will be adding satellite internet to Thunderstruck Ridge Cabin the beginning of 2019! This place is simply unbelievable. The pictures of both the cabin and views are spot on. We stayed at the cabin for 5 nights while riding motorcycles in the Smoky Mountains and loved every minute of it. First thing to do every morning is walk out on the porch and see how the view has changed due to clouds and position of the sun. The cabin is spotless and has every accommodation you could ever need. We will be back. Fantastic cabin and view! Cleanest facility we’ve ever rented...by far! We loved Thunderstruck cabin! Beautiful views and cabin is superb! Very tastefully decorated. Felt like home. Wife cried when we left. What a great place to spend a week ! Everything was just as advertised, maybe even better ! Lissa has this cabin set up just like home. Everything you need for a great stay. The view is awesome ! Cant wait to go back! Thunderstruck Ridge Cabin is located minutes from downtown Maggie Valley , Biltmore Estates in Asheville, Cataloochee Ski Resort and Cherokee. Enjoy the many unique shops and restaurants in the quaint town of nearby Waynesville, hit the Cherokee casinos, or take a ride on the Blue Ridge Parkway that is only one mile from the cabin! We require a signed Rental Agreement before reservation will be confirmed. We will need the names of each person staying at the cabin along with your home/cell phone numbers, email and physical mailing address and we'll send you the Agreement for review.